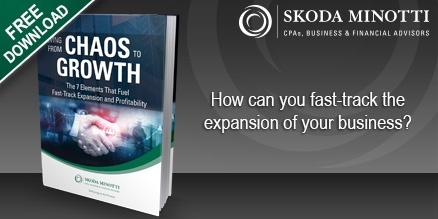 This blog series examines the 7 elements that fuel fast-track expansion and profitability, each of which is absolutely necessary in today’s competitive and evolving business landscape. When thoughtfully designed and faithfully implemented, these 7 elements allow a business owner to set the long-term vision of the business, define roles and responsibilities throughout the ranks and as a result, practically enable the business to operate by itself. In this blog, we examine the fourth element: Levers. Levers are those tools that drive great process efficiency and also support greater volume. Typically, these are automated systems such as computers, applications and related technology. In the early days, computers were developed to enable the rapid and efficient processing of bills and accounts receivable. Today, modern systems can efficiently track inventory and customer needs; conduct automatic reordering of raw materials; and validate that products have been received in excellent shape, all while tracking the movement of materials and products through the supply chain. Modern computers enable a few people to do what previously took dozens, hundreds or even thousands just 20 or 30 years ago. Given this speed and efficiency, things can go right very quickly, or wrong just as quickly. Processes must be well designed and tightly integrated to the computer systems that are designed to support them. New technological levers are advancing rapidly and create unforeseen benefits. The internet of things (IoT) enables the real-time monitoring of parts and materials no matter where they are. Automaker Tesla can track the status of its cars, post sales and deploy real-time upgrades to the computer software driving the car. Artificial Intelligence (AI) enables voice-integrated and activated processes to allow for hands-free integration. Tools such as Alexa (Amazon), Siri (Apple), Google Home and others are creating continuously improving voice-activated tools that can significantly increase the efficiency and effectiveness of our workforce. Sage Intacct (an ERP publisher) is focused on creating ERP and accounting tools that will eliminate the month-end close and the annual audit. With technologies such as blockchain (technology underpinning cryptocurrencies such as bitcoin and ethereum), we can simplify month-end closings for houses, and strengthen the security of medical records and credit card information. New and still evolving technologies such as virtual reality (VR) and augmented reality (AR) are reducing the need for training and printed manuals as employees can get information on parts, processes and procedures superimposed on parts, machines and other elements in their workspace. Training can occur in real time through VR and AR. For your business, think about where levers can be deployed to drive speed and acceleration, greater accuracy, improved training and error reduction, and consider how they can work as part of a systemic environment to improve processes. In your operation, and in all others, levers and processes don’t exist in a vacuum; they are woven, along with each of the 7 core elements of winning operating models, into a broad operational fabric. Do you have questions about fueling expansion and profitability in your business, or other business challenges? Contact Dave Mustin, MBA, at 440-449-6800 or email Dave. This entry was posted in CPA & Business Advisory, Mailchimp RSS and tagged automation, business growth, Business profitability, cpa & business advisory, efficiency, elements, levers, technology. Bookmark the permalink. Follow any comments here with the RSS feed for this post. Comments are closed, but you can leave a trackback: Trackback URL.